Mary Bernsen was born in the Philippines but grew up in Southern California. She also spent part of her earlier years in Jakarta, Indonesia and Cabanatuan City, Philippines. She now resides in San Francisco, California with her husband and two dogs. Her work has been featured in several local newspapers in California, various blogs, and recently, her work with the Occupy movement was part of a group exhibit, "Occupy..." in Oakland. Mary is a reactionary photographer-capturing image of broad subjects that crosses her path. She enjoys all aspects of photography including lifestyle, landscapes, abstract, sports, as well as documenting her frequent travels; she especially loves the abandoned, the forgotten, and the decrepit. Her love and passion for photography began when she was 14 years old after joining her high school's Yearbook and Journalism class where she won several awards in photojournalism. 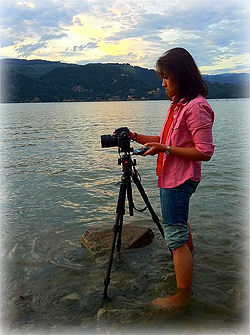 In 2010, she entered her first photography contest,Ecovelo's "Why I Ride" and won which rekindled her passion for photography. Mary is very grateful for the continued love and support of her family and friends over the years. She is easily drawn to people, energized by a simple conversation with friends and strangers alike, and at her happiest when outdoors.